For many years, academia has relied on citation count as the main way to measure the impact or importance of research, informing metrics such as the Impact Factor and the h-index. But how well do these metrics actually align with researchers’ subjective evaluation of impact and significance? 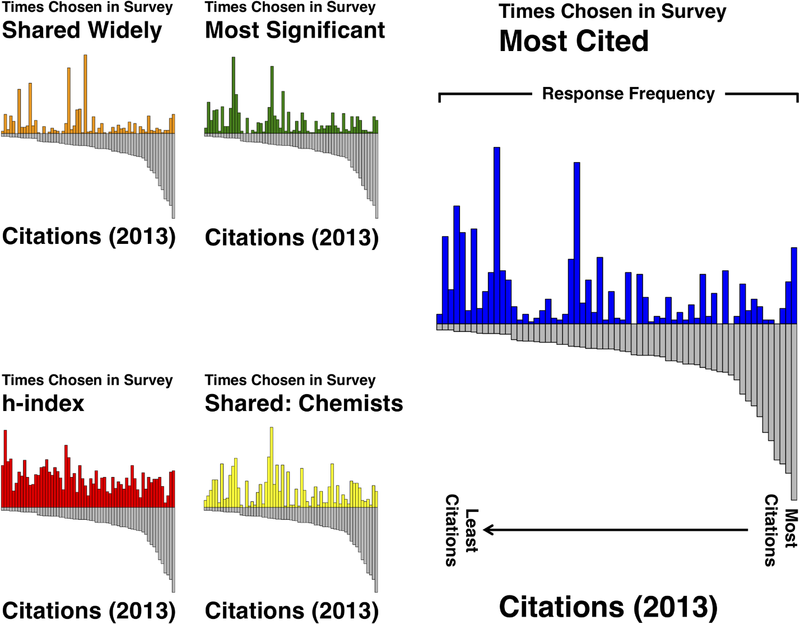 Rachel Borchardt and Matthew R. Hartings report on a study that compares researchers’ perceptions of significance, importance, and what is highly cited with actual citation data. The results reveal a strikingly large discrepancy between perceptions of impact and the metric we currently use to measure it. This blog post is based on the authors’ co-written article, “Perception of the importance of chemistry research papers and comparison to citation rates”, published in PLoS ONE (DOI: 10.1371/journal.pone.0194903). One issue we all struggle with is that the broadest definitions of impact tend to be lists of abstract virtues and subjective assessments of what is ‘impactful’. Altmetrics often only indicate level of popularity and/or controversy surrounding a publication. In the last Ref, the impact statements were typically subjective storytelling, with little comparability even in the same disciplines. Qualitative versus quantitative indicators are always likely to be an issue here. The authors are right to highlight the need for gatekeepers of assessment to get to grips with this. Given the significance of bias in the review of scientific articles, I’d be interested in learning how you addressed and assessed implicit gender bias in your study. Thank you. Isn’t it clear that bibliographic indices (and also monetary ones, by the way) cannot correlate with anything? Their distributions are all so strongly skewed that if you plot them against each other, all observations clutter in the lower left corner. Any regression line is exclusively determined by the outliers in the plot. By the way, any distribution approaching an exponential strongly suggest that most or all variation is due to pure chance factors. Some journals implicitly give a higher premium to submitted manuscripts that cite previous articles published by the same journals. Data from citations can thus be informed by this bias. While citations should not be discarded altogether, readership should also play a key role in impact factor analysis. For example, if I make my article available on a research repository like Bepress or SSRN, I get monthly statistics of downloads of my articles. Accessibility and readership of my article should count with respect to impact factor. For an academic, impact factor then may not be judged on the journal you publish in but rather the accessibility of your work. Merely seeking to publish in a journal with a high impact factor based on citations can just result in free-riding on the success of a few frequently cited articles in that particular journal. If the main aim of publishing is to disseminate and advance the frontiers of knowledge, then readership should play a critical role in impact factor analysis. This can also compel more publishers to make accessibility a key component in their publishing decisions.